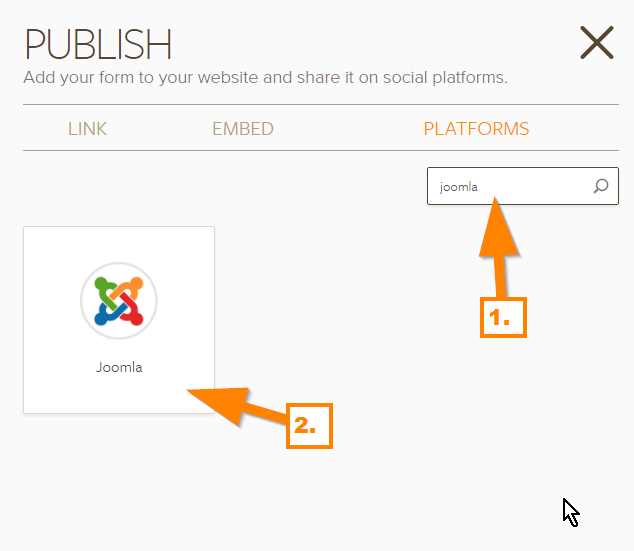 How to embed JotForm in Joomla 3.6.4? I am having trouble getting any jotform to embed into a joomla article. Upon checking this webpage http://staging4.madisoncountyky.us/index.php/building-zoning/handicap-access-violation, I cannot find any trace of a JotForm embed code. May I know where you inserted the embed code? Because it seems like it was not properly placed on an area where it should be. Or the extension that you might be using is not enabled. 1. First, click the "Publish" button. 2. Navigate to "Platforms" tab and search for Joomla. Click "Joomla" in the selection. 3. 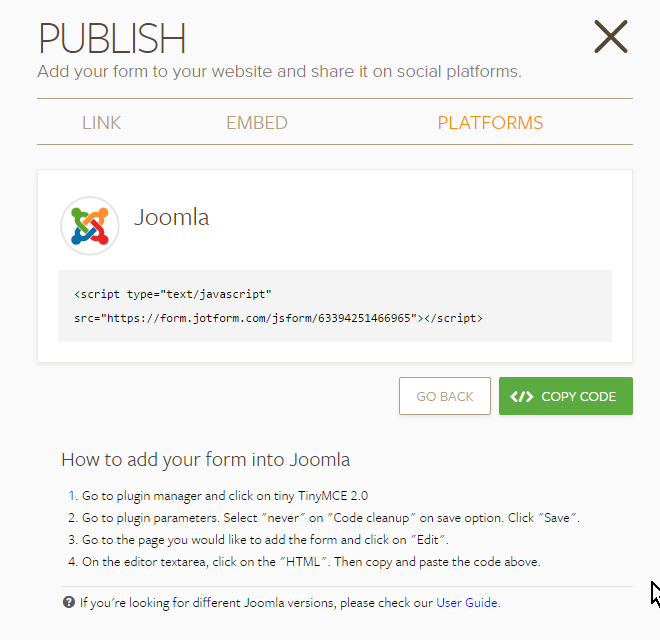 Now you will see the embed code and the steps on how to embed your form there. You can follow these steps and see if that works. That is what I did, take another look now and see if you can tell. I am using the JCE Content Editor, installed the Sourcerer plugin, went to the article, hit the insert code button and pasted the embed code between the source tags and saved. I am seeing the code in the source code of your website, but it is not displaying in view. Could you try re-embedding the form using the iFrame embed code instead? Here's a guide about it: https://www.jotform.com/help/148-Getting-the-form-iFrame-code. Instead of using the <script> code, try that one instead. It seems like there's a design or CSS issue in your website that causes the form's appearance or display to not show up in view. that seemed to do it, I did not think that would work so I never tried it; but it works like a champ. Thanks! I'm glad you're all set and we appreciate you keeping us posted. If you have other questions, don't hesitate to open a new thread so we can help.